Ready Decks® was established in 2001 with a single goal: to provide the highest quality site-built decks in the shortest time possible while offering homeowners the greatest value. That mission has continued unchanged, even through the tremendous explosion in the Home Improvement Industry. At Ready Decks®, we’re committed to providing you the ultimate consumer experience, which can be summed up in three words: Quality, Value, and Integrity. 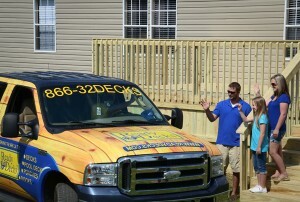 Many factors contribute to the satisfaction of a Ready Decks® customer. We strive to provide you with the best possible deck or porch while at the same time bringing you the most deck for your money. When you work with a deck or porch builder from Ready Decks®, you’ll get a high-quality, affordable product. Every Ready Decks® deck installer uses only the best materials. Our decks are constructed using premium-grade, treated lumber. Decking boards are hand-selected at the saw mill, guaranteeing freedom from knots and heart-of-pine boards, but quality doesn’t stop there. We use only ACQ-approved ring-shank fasteners, designed specifically for speed, durability, and strength. Stronger, faster, and more corrosion-resistant than a screw, our fasteners will make your deck last longer. In business, there is only one way to demonstrate integrity: stand behind your product. Every deck we build is backed by a lifetime limited warranty, so you can be secure in the knowledge that your Ready Deck has been built to last by quality-, value-, and integrity-driven deck building contractors.